shown seated wearing a long Persian style coat gathered at the waist by a simple belt which is looped over and hanging down in back, with a close-fitting cloth headdress tied over his hair, the heavy coat fastened by a large button at one side and with the toes of his shoes emerging at the hem, his head turned to one side, with well-modelled facial features set in a calm expression, his left hand held up to his chest with fingers closed into a fist and with a long curving horn-shaped rhyton in his right hand held out in front, made from brick-red pottery and covered with chalk-white slip, the headdress painted in black and with a trace of red paint on the lips, the underside of the legs originally modelled as flat perpendicular surfaces to rest on a square-cut base, with traces of earth from burial overall. A small sancai-glazed pottery model of a foreigner holding an oversized horn-shaped rhyton, excavated in 1932 from Qionglia, Sichuan province, is illustrated in Zhongguo Wenwu Jinghua Daquan, Taocijuan (Compendium of Chinese Archaeological Treasures, Ceramics), Hong Kong, 1993, p. 130, no. 453. 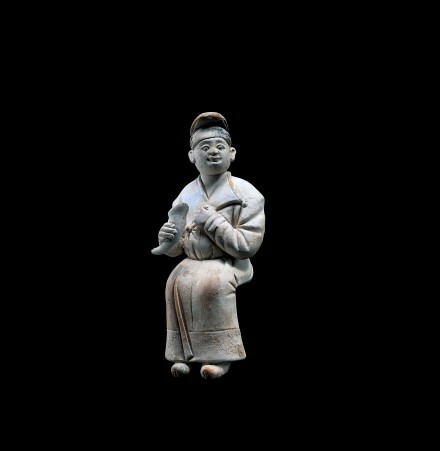 Compare also the depiction of a female attendant holding a rhyton in her right hand and a wine pot in the other, engraved on a stone panel in the tomb of Li Shou, (who lived from A.D. 577 – 630), discovered in 1973 in Sanyuan county, Shaanxi province, which is illustrated in a line drawing in Hua Wu Da Tang Chun – Heijiacun Yibao Jingcui (Selected Treasures from Hejiacun Tang Hoard), Beijing, 2003, p. 39, fig. 19. A brief excavation report on the tomb of Li Shou published in Wenwu, 1974, No. 9, pp. 71-88, with pictures of selected engraved stone panels showing dancers and musiciennes, presents the context of this image of a Chinese figure wearing a Persian style coat and holding a Persian style drinking horn as part of the furnishings of a Tang dynasty tomb. This image was intended to show the rich cosmopolitan atmosphere of the Tang court, with exotic ‘Silk Road’ luxury goods enjoyed at elegant banquets, and to indicate the high rank and sophistication of the occupant of the tomb.